For the love of life: Happy Halloween and a Boo!!!! Happy Halloween and a Boo!!!! 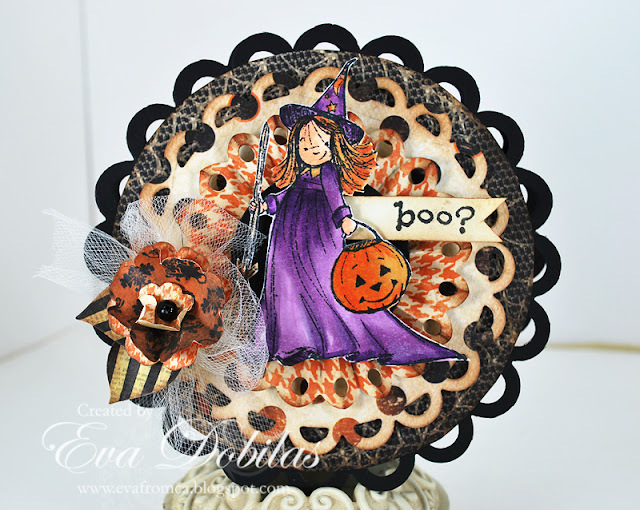 Hi again, I have some fun Halloween creations to share with you today. It's not too late to make some decorations, cards, or little treat boxes, so that's what I have to show you today. I bought this adorable little stamp called A Tiny Witch from Unity a little while back. It's by Phyllis Harris. I sure love her designs and have a couple of them to play with still. I have been eying it for a while, as she is just too cute... I paired up this little stamp with some super fun Lifestyle Crafts dies. So let me show you what I made. Oh and by the way, the sketch of my card is based on this week's Mojo Monday sketch. Love their sketches!! So, I have a little round card with a pretty coffin as my Halloween decoration. 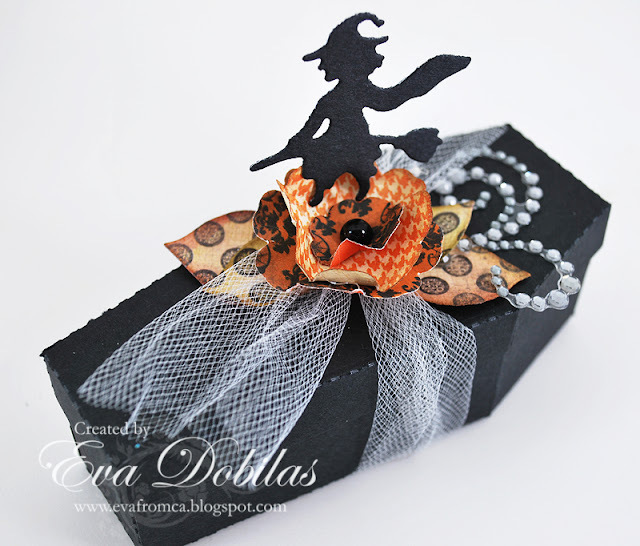 The papers are by Authentique, called Enchanted...love this line, it's my favorite for this year's Halloween. And now let me tell you about the dies.....I used quite a few on these creations. Let me start with the card shape itself. And before I even tell you what die I used for it, what I love about their Nesting dies is that they have a lot of sizes in one package, but most importantly the largest one seems to be always perfect for a large card size, which I LOVE. My typical card size is either A2 (4.24"X 5.5") or 5.5" x 5'5" square. This card is circle, but it's about 5.5" wide circle...so you see, they are perfect for a card base. 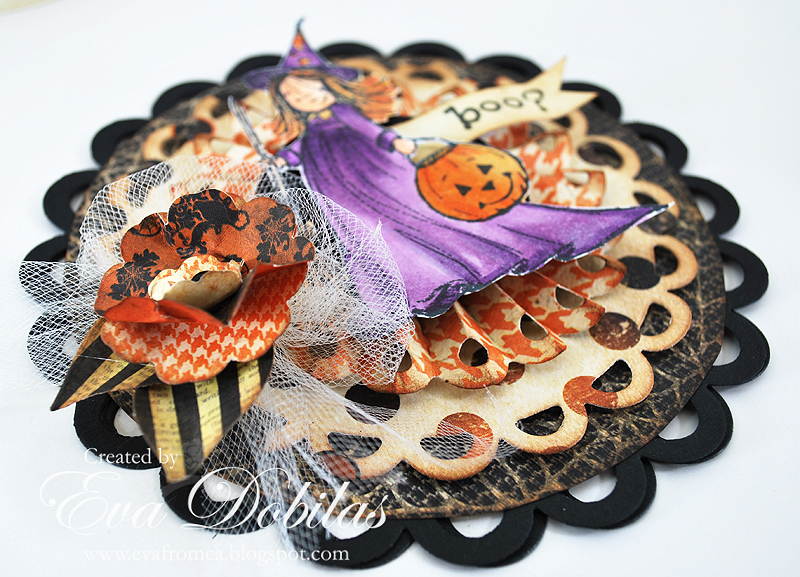 On this card I popped my little witch on top of a Doily Rosette die. I just thought that would be super fun and I like the way it turned out..not to mention it worked great with the sketch as well. I also wanted to make some flowers, so I worked with another nesting die called Nesting Blossom Die. I used the two smallest dies from the package to create my pretty flowers for both the card and the coffin. The other nesting dies I used on this card is the Nesting Leaves dies. I just love how so many sizes of leaves come in this set and some are even different shapes. You can see a close up of my flower here. And finally let's talk about my coffin...by the way, how cute is this, isn't it???? The best part is that it was super duper easy and quick to put it together, so it makes a great product to use as you think of what to give to loved ones for this Halloween. You can put candy, or some other kind of goodies in it, decorate it and give it to your favorite Trick or treaters, or just use it as a centerpiece, like I am. 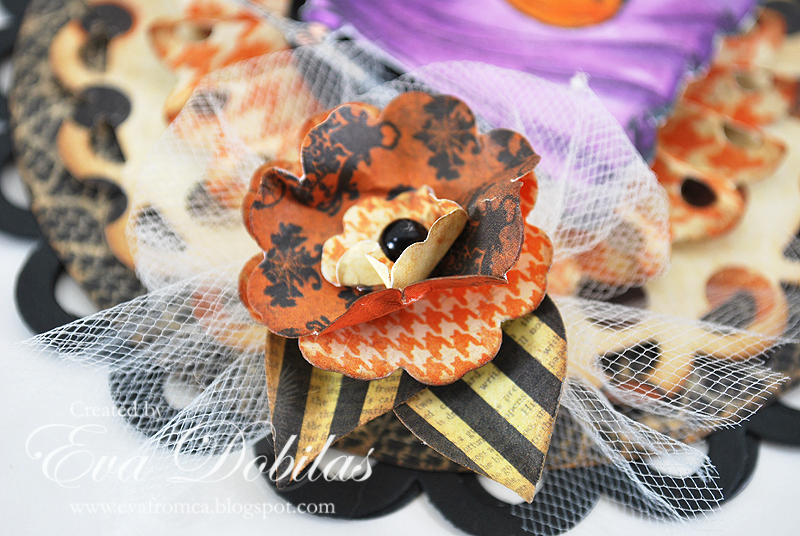 For this I used the Coffin Box die and once I added my tulle, I topped it with flower and leaves and popped up a witch from the Witches die set. So, what do you think????? Isn't this an adorable ensemble? I sure love it and will be my little decoration for tomorrow. And if you are interested in these dies, or even other Lifestyle Crafts products, I have a coupon code I would like to offer to you, as you purchase these dies at the Lifestylecrafts website. You can get 20% off just by entering FORTHELOVE. By the way, have you seen their Wintertide release???? OMG, so much to love in that collection. I ordered a few myself and as soon as they come in I will be creating. The Village die is awesome in my book and can't wait to play with it!!!! Here are the dies I used once again. You can just click on them to take to the store direct. How easy is that?? Thanks for visiting and wishing you a beautiful day and Happy Halloween for you tomorrow!!! !